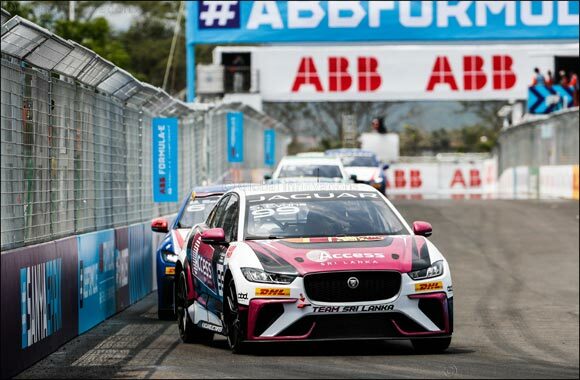 Dubai, UAE, March 27, 2019: Cacá Bueno made it to the top step of the Sanya podium for the first time in his Jaguar I-PACE eTROPHY career, after starting on pole. The Jaguar Brazil Racing driver capitalised on a red flag by accelerating away from the rest of the field when the race restarted. The Brazilian crossed the line more than 1.5 seconds ahead of second place, Simon Evans for the first eTROPHY race in China. Team Asia New Zealand driver, Simon Evans, returned to the podium for the first time since the first race in Ad Diriyah, Saudi Arabia. His closest on-track rival in Sanya was Bryan Sellers as they tussled for position throughout the race. Sellers kept the pressure on Evans during the fourth round of the Jaguar I-PACE eTROPHY race but Evans defended well. Crossing the line first in the PRO-AM Championship and scoring maximum points in Sanya, is Bandar Alesayi. Round four in Sanya is the third race that Alesayi has won so far extending his lead in the PRO-AM Championship with a total of 77 points. David Cheng, the Jaguar I-PACE eTROPHY VIP driver, finished seventh having started the race with a drive through grid penalty due to an incident in qualifying. Following the race in Sanya there were two steward’s decisions that changed the provisional results. Sergio Jimenez received a one second time penalty due to contact with Stefan Rzadzinski, dropping him to fourth place. Bryan Sellers was disqualified due to a technical infringement which promotes Stefan Rzadzinski to third and gives the Canadian his first eTROPHY podium. The Jaguar I-PACE eTROPHY is the first international series for battery electric production-based cars and is a proof point of Jaguar Racing’s Race to Innovate mission. The series now heads to Europe with the next race in Rome on Saturday 13 April.